Arnold Red Honeysuckle is a great shrub with great summer color and the sweet fragrance of honeysuckle. 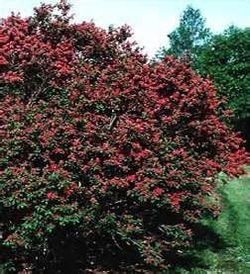 This is a rounded shrub that will grow to a height of 6' to 8' tall and 6' to 10' wide making this a great shrub for a specimen, shrub border, screening or an informal hedge. Arnold Red Honeysuckle likes to be planted in full sun. The leaves are a blue-green which emerge before many other plants in early spring. Fragrant dark red blooms appear in late spring which attracts the hummingbirds and butterflies, a favorite of these visitors to our yards. In late summer to early fall, small red berries are produced attracting wildlife and birds.